Little boys are fond of cars. 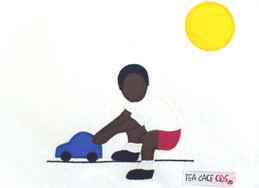 This colorful t-shirt features an applique of a small boy playing with his car. White t-shirt 50/50 Poly Cotton Blend with custom design applique of character.